Up until mid-2016, the city would simply have people on a weekly basis dump yard material in the street, and bring the claw by to collect it. That changed, however, for a variety reasons and the collection service became a once per month for the majority of the year, with weekly from mid-October to mid-December. The city is paying around $610,000 yearly for this service, about 5.7 percent of the Recology contract. On December 4, the council selected three options: A) 16 pick-ups per year or “Once per month pick-ups from February to September, then every other week pick-ups from mid-October to mid-January.” B) 15 pick-ups per year or “Once per month pick-ups, with two extra weeks of pick-up in the fall and one in the spring.” C) 12 pick-ups per year or once per month. On January 7, there was an Alternative Open House with more than 70 people in attendance. It seems that the cost of this service is being analyzed in isolation without consideration of the cost of the containerized waste program yet it is the containerized waste that is the new service. The recently proposed increase in fees is based on the fact that the city instituted containerized collection of yard waste without paying for it still there is no analysis of the entire yard waste program. Perhaps the city should have considered the cost of containerized waste before implementing the program instead of after. Also there seems to be no analysis of the cost of hauling to the dump the occasional overflow of yard waste. I guess that isn’t a city problem just one for its residents. As I tried to point out at the first hint of this, containerization is a windfall for the container and truck vendors. The containers themselves cost big bucks. $65-$200 ea. even in quantity. Most vendors have a “logistics” operation who deliver for a ludicrous up-charge. It allows for ne’er do wells to hide garbage inside the “green” waste and also is a hell of a lot meaner if you hit it in the dark while riding your bike, skateboard or motorcycle than a pile of grass and can put a couple of grand worth of body work on your Volvo, too. Who plows into a full-sized waste container? I have plowed into a leaf pile a time or two — my own d*mn fault for not using a beam light that would allow me to see what’s in front of me (like d*mn near all night riders). But unless someone is coming at you with high beams in the rain where there isn’t a streetlight . . .
. . . and seriously, we are arguing about the definition of “full sized” here? I’ll have a vente grande container, please. The organic containers were mandated by state law requiring diversion of food waste from the trash waste stream. So it is the LITS program that is the add on, not the other way around, and the $610,000 annual cost is additive to the mandated collection programs. In addition, the dedicated equipment is aging will have to be replaced in at most 5 years at a cost of $1 million. That cost will be likely be rolled into future rates. The NRC recommended further study of the program to determine if the benefits of the current program are sufficient to justify the cost. However, the LITS program likely will violate upcoming stormwater runoff rules from the State Water Resources Control Board, so that’s an important consideration. The waste containers are out once a week, and usually colocated with the 2 other containers, so a cyclist would have likely hit one of the other waste cans instead. The organics cans add no incremental risk. On the other hand the yard waste piles can be out for days or even weeks and present unanticipated hazards for cyclists and runners. The votes received at the open house and by email showed 51 in favor of the 16 pick-ups, 6 for 15, and 10 for 12. Oh, God how I love the show of these government sham “3 choices” meetings. Would you like 1) A poke in the eye, 2) A punch in the jaw or 3) An annoying prod. Thank you all for coming tonight and participating in your local government. This is some of your best work, Alan. The council should not phase out or discontinue the service. There are many other solutions that have not yet been fully explored and discussed. Davis and Woodland are almost unique in California is still providing this service. Other communities have somehow managed to handle their yard waste through containers. I can’t think of any city policy, other than the water project, about which I have heard such vigorous commentary from the people I talk to (who, obviously, tend to be active gardeners). The consensus I am hearing is that the leaf pickup season needs to be extended to be weekly through December, and that provision for the small-tree pruning season needs to be weekly through January and into February. The bins are especially impractical for pruning work. Other communities have somehow managed to handle their yard waste through containers. I can’t think why this is relevant, but we hear it every time this issue comes up. We want to encourage people to garden, to grow their own fruit and vegetables and share them with their friends and neighbors and with the Yolo Food Bank. We should not take away a popular and successful program that encourages homeowners to grow trees and care for them properly, thereby making that more difficult. The expense of hauling it away is onerous for many individuals, but readily balanced across the broader city population as part of the existing service. The bins are very impractical for anyone with a garden or small family orchard or who is properly caring for the smaller trees on their property. We can encourage people to compost on site, but that isn’t an option for everyone. I strongly urge the council to retain the landscape leaf and branch pickup service, and to expand the frequency at certain times of year, and I know I am speaking for many people when I say this. There are competing issues however. 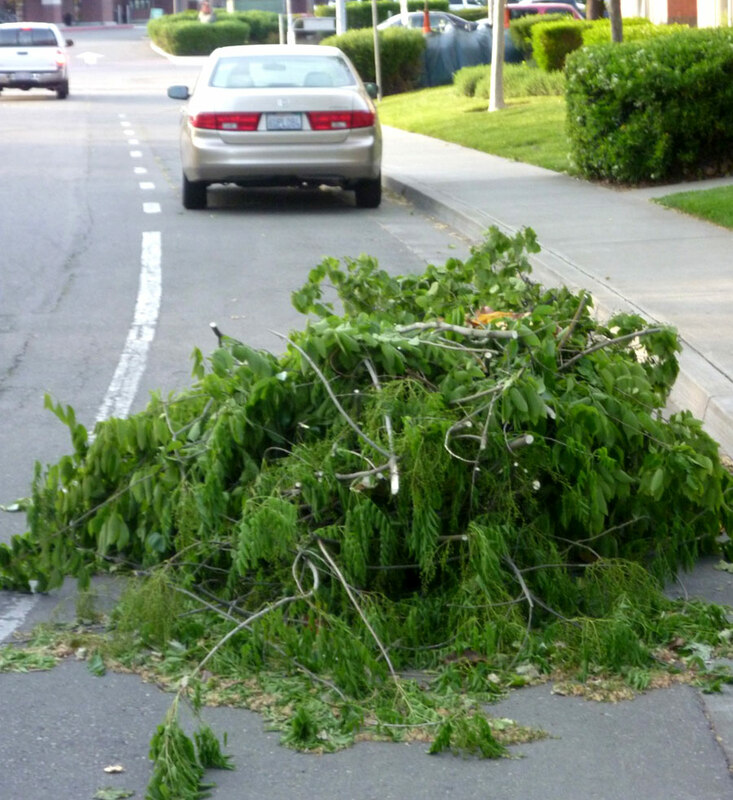 Yard waste creates a real hazard for bicyclists. Sometimes you don’t even see the sticks protruding from the pile. There is the environmental concerns about yard waste mixing into the wate water. And apparently it is more costly. I agree, and the best tool we can provide to reach that goal is to teach them how to compost and not to make it so easy to simply throw away all of their organic matter as ‘waste.’ Even a static compost pile makes a beneficial product in time while taking up only a few square feet of yard space, even less in total if neighbors agree to share a pile. As for most of the annual prunings from fruit trees, those will generally be small enough diameter to be easily cut into 1′-3′ lengths to be put in the bins or be used as mulch. It only takes a few more cuts, not hours of additional work. I agree that large branches are a burden, but as Richard says there are other ways of dealing with those. What makes absolutely no sense to me however is putting leaves and grass clippings in the street as both are useable directly on site as mulch or additions to a compost pile. We have invested in the containerized program. It is time for the City to stop in-street pickup and require the use of the containers for disposal of any organic material not utilized as compost or mulch on site. That is how we may properly care for our backyard ‘farms’ and the environment. Don, who do you think is giving you that opinion? People for whom it is an issue. People for whom ending the LITS program is desirable are not on the warpath. Well, maybe except for me. But then, again, when I come into your shop, you are always bent over the computer so we don’t converse on these topics. My office is downstairs so that I can answer questions and talk to people in between ordering and budgeting, so just wander over and say hi any time. I spend all day talking to people, basically, and it’s a nice diversion from paperwork. But obviously my sample is self-selected gardeners who care about the issue and is no more scientific than the study cited elsewhere. Based on what I’ve seen and limited input to the city so far, I think it is reasonable to conclude that the public prefers the program or even wants it expanded. I have seen that view expressed firmly to a couple of council members on Facebook as well. Just ask Lucas or Will what they’re hearing. I’d certainly support having a more systematic polling done of the public views on this, but based on the limited evidence we’ve seen I’d bet you won’t like the outcome. I wonder how much the containerized yard waste program costs and what percent of the Recology contract does that represent? From my recollection, the primary driver for moving to the containerized system was the anticipated change in the regulations regarding water quality from rainwater runoff. As far as I was concerned, this was the only legitimate argument as I never bought into the bike safety arguments which to me were user error issues. If water quality is still the driving concern, then the City needs to fully implement the containerized system and focus on changing behaviors instead of facilitating a continuation of the old ‘throw it in the street’ approach. I don’t use either system as virtually all the yard waste from my yard is reused onsite as either mulch or compost. What I witness around my neighborhood however is a great deal of material that would easily fit into a container being thrown into the street instead. As long as that is an option, the containerized system will not be successful. If water quality is the important criteria, then the street piles need to be discontinued. As it is, the only things that should be allowed in the street now are wood prunings that are too large to easily fit into the container. Grass clippings, leaves, and other soft materials should be completely banned from the street. I never bought into the bike safety arguments which to me were user error issues. While I agree with almost all you say in your various posts… I certainly don’t with this. We are *creating* a hazard to bicycle travel, and purposefully reducing public safety. We are making our streets dangerous by design. A key step forward in this matter would be separating management of street trees from yard waste. Many of those advocating for continuation of the program have large street trees and they need assistance in disposing of the leaf, fruit and seed droppings. There are available solutions that could be beneficial if only handling that waste. Yard waste then can be handled separately. Yes! Where is the “like” button? I’ve been saying this for years! These issues need to be addressed separately. My situation may be typical of single-family yard waste management in Davis: we have a large-ish yard with multiple trees (3 big, 2 medium and 2 small, roughly speaking) and shrubs, and a small lawn (of which I hope to be rid within a year). I’m not inclined to gardening, and while my wife enjoys it she hasn’t been able to do much of it in recent years due to injury and general time commitments, so we have a gardener come in for an hour most weeks to perform routine maintenance. He puts cuttings in the container, though he’ll pile any overflow in the street on the unusual occasions that he generates same. I mow the lawn and deal with occasional prunings, and have also dealt with a few small tree removals (with more coming up due to a remodel). After several attempts at composting spanning a dozen or more years I found that I’m just not sufficiently interested in it to properly manage either dedicated containers or an informal pile, so when we got a 96-gallon container I happily began using that instead. The container holds a lot of material if you’re at all careful loading it, and storing excess material on-site to be containerized over a week or three has been quite a workable solution. While it’s not nearly as simple as just dumping all the material in the street at one go, I’m not finding the container use to be burdensome. I won’t really miss street pickup if it goes away. I agree the claw’s time is up. As long as it’s an option, it will be the default. It’s the TYSITS program, Throw Your Sh*t In The Streets. It treats the public domain as a sewer. Water quality may be an increasing legal requirement, but I hear that people (many who prefer the claw) also want clean streets and more frequent street sweeping. I think the city has to decide what its goal is for this program and then pursue it. If the goal is clean streets, no TYSITS. If the goal is to avoid Water Quality Control Board sanctions, no TYSITS. If the goal is to make the loudest complainers happy, keep the claw and let those people pay for it exclusively. I’m pretty confident that if everyone in the city ranked all of the services in importance and that list were in front of them with the price tag, the TYSITS program would end up near the bottom. I do have strong opinions on this topic. I also have sympathy and a certain amount of empathy for some people who I dearly love that feel they can’t live without the TYSITS program. Just to see if my opinion was justified by the real world, I decided before the leaf season began to test my opinion against reality and started blowing the leaves from the front yards of my neighbors and binning any neighbors’ piles that they placed in the street. This past fall, I kept up with the front yards and driveways of 11 parcels on my street. I scooped their big and small piles into whoever’s bin was left accessible. Yes, sometimes I had to pull out my bow saw and bring out the loppers, but I never had to use more than three of the large bins. Occasionally, I got to all 17 parcels on my street and another six around the corner on the same day. Never more than five bins for all those parcels. Okay, you can go ahead and call me weird for doing other people’s work and you can say, with justification, I seem to have a problem with boundaries, but nobody objected. Some even thanked me. Most of the time I ended up leaving the street cleaner than when the sweeper comes through. In fact, the sweeper did come through after one week of duty and left more crap behind than it picked up. That’s another problem for later. Bottom line, I don’t buy it that we need the claw. I do accept some people may actually need a second bin. I am okay if the rate I pay includes providing a second bin for parcels where street tree leaf drop is heavy enough to warrant it because these are street trees and benefit everyone. But all the talk about backyard gardening and orchards is a personal choice not just to garden but how to garden. We have six fruit trees, but they are kept under 6 feet tall. We never get to an unmanageable amount of pruning material and we do not compost on site. The issue of street waste, or even organic waste at all is fundamentally a management issue for each parcel. The city should not have to be held hostage to individual management decisions by individual parcel managers. Thanks for your great post, Dave.